3, xxv + 104 pp. 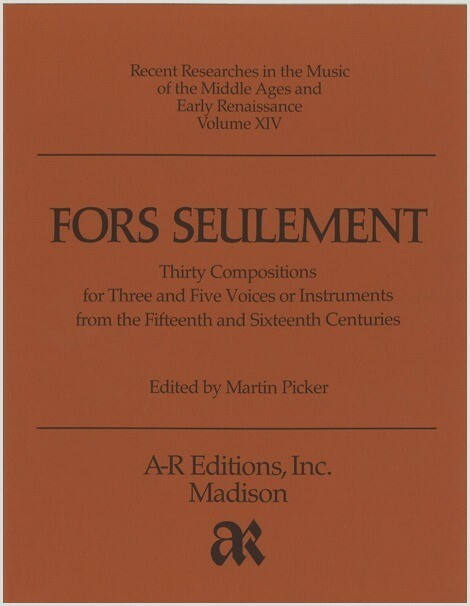 This edition contains all the known complete secular pieces derived from Johannes Ockeghem’s rondeau “Fors seulement,” including those by Jacob Obrecht, Pierre de la Rue, Matthaeus Pipelare, Antoine Brumel, Gilles Reingot, Marbriano de Orto, Johannes Agricola, Andreas de Silva, Antonius Divitis, Jacobus Romanus, Johannes Ghiselin Verbonet, Josquin des Prez, Anthoine Févin, Jörg Blankenmüller, and Adrianus Willaert. The settings range from three to five voices and may be performed by voices and instruments in any combination.